We've received lots of cool fall pix and more and want to share them with you. Also, we're just about to update our website and . . .
We are grateful to receive so many fun and inspiring images. Here are a few for your enjoyment and inspiration. I am loving ING !! 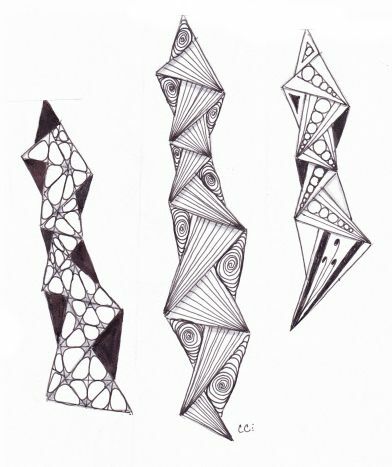 I really like simple tangles with endless possibilities, I've attached a few. 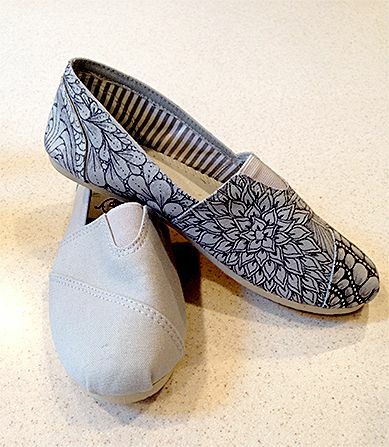 More importantly, I want to tell how much Zentangle has added to my life. I started doing it when I tore my meniscus and couldn't walk. I tangle virtually every day. It has become an important part of my self-care plan and I find it very meditative. Thank you so much for helping so many on their journeys. I am a CZT in Annapolis, Maryland. I just thought you'd enjoy seeing these canvas shoes I bought for $5.00. I'm sure you have lots of pics of outrageously beautiful shoe designs - but this one was meant to be a "reachable goal" for the new student. I also put out a set of notecards, a framed tile, and the glass coasters (you highlighted a while ago) as gift ideas for the holidays. Use if you'd like, with my complete permission, and gratitude for continuing to inspire us. Your are outstanding!! Thanks. I loved the ideas from the sculpture and especially the mannequin and the dishwasher!! 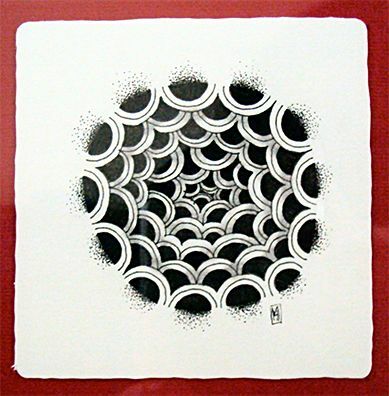 I have been drawing my own tangles in my work from time to time since I first met your site in 2003. I have enjoyed doing drawings since a child and that was over 80 years ago! I am still doing it! Thank you so much for developing this incredible method of forgetfulness and creative mind blowing exercises. P.W. It's October, and around here, that means Halloween decoration. 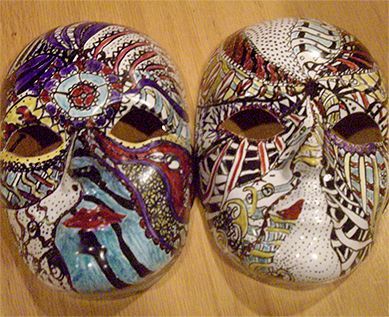 Louise sent us pix of tangled masks . . .
and CS, this fun tangled hat . . . I am a graphic designer with over 30 year of experience. 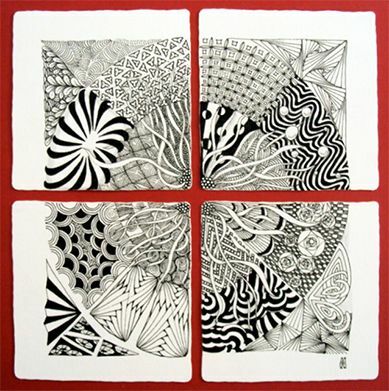 I always thought of Zentangle as more 'craft' than art or design. I just saw the two Bijou videos. They are brilliant and charming. I am inspired to return to my art training and spend far more time on personal work. Thank you - please more! A.M. I wrote to you several months ago about an exhibition in which I had some tangles. I have been trying to track down a decent photo, but in the end, after all this time, I have decided to just send my own photo of the event. It went well. I sold most of the pieces. Six were bought by the local council as inaugural purchases for their Local Artists Collection. There were a lot of enquiries from visitors and I was able to pass on cards for my lovely local CZT, Lianne Woods. 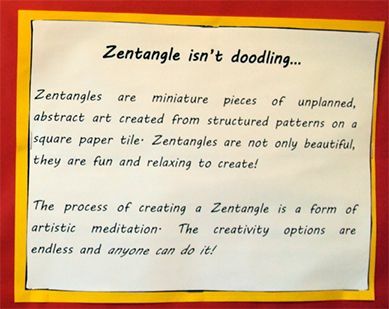 My 10 year old son has also well and truly caught the tangling bug. Long story short, I ended up spending one day a week with his class showing them the basics. They took to it like ducks to water. I love the way children approach this. When first you tell them they cannot rub anything out they are horrified. But then, when "nothing is wrong" sinks in you can see the change coming over them. They just soar with it. Show them a tangle and they'll show you a variation. One of the boys came up with a variant on squid which I am still using. They checked out the website and did searches in computer time. 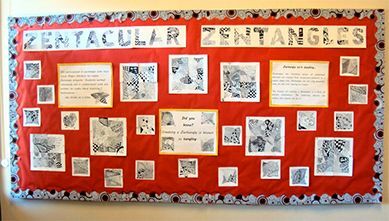 Zentangle crept its way into drawings and other art activities. Anyway, they decided they wanted to do a display for the front office of the school (classes take it in turns. Sometimes it is stories, other times artworks). We had done a couple of single tiles each, and then I pre-strung sets of four composite tangles (sets of four worked better with the numbers than sets of nine) with codes on the back so I knew how to put them together at the end, shuffled them and handed them out randomly to the class. They knew what the end idea was, each tangle made up of four tiles, but not who had the other ones in their sets. Even so, it's a smart class (gifted stream), so some of them went around checking all the tiles and worked out the code. But by then the tangles were well underway so it was too late to work out some sort of co-ordination. They loved how it all came together in the end and then got together as a class to work out the display. The kids choose the title and worked on the info cards with their teacher. I didn't see the finished product till it went up in the front office. It is the first thing visitors see when they come in and has been up for more than one term now. They had a great time and some of the kids have continued on with it. All the images we see and stories we read reminds us of this quote we recently played with. A quote from Bertrand Russell caught my eye (perhaps it was the "paradox") . 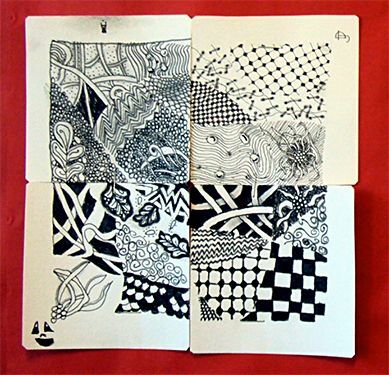 . .
"The method of Zentangle is something so simple as not to seem worth stating, and its results and effects are so amazing that no one would imagine them." We have been redoing our website for several months. This has been a big project and we expect to switch over sometime in the next few days from the current web design to our new web design. 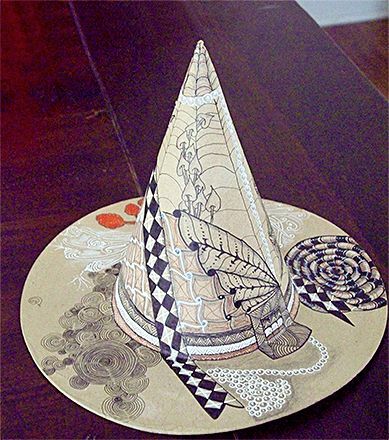 When we make that switch, we will also announce our 2015 Certified Zentangle Teacher (CZT) seminar schedule and open registration. We intend for this transition to be smooth. We also ask your patience in advance as we respond to unexpected bumps along the way. We're excited about our new design and we think that you will enjoy and appreciate all the changes and upgrades. We look forward to your comments and thoughts on this new blog series.